Undergraduate student and this year's University delegate, Alex Butterworth, will join young people from around the world at the summit in The Hague. Currently in his fourth year of study, Alex will travel to the Netherlands in October to attend the summit. 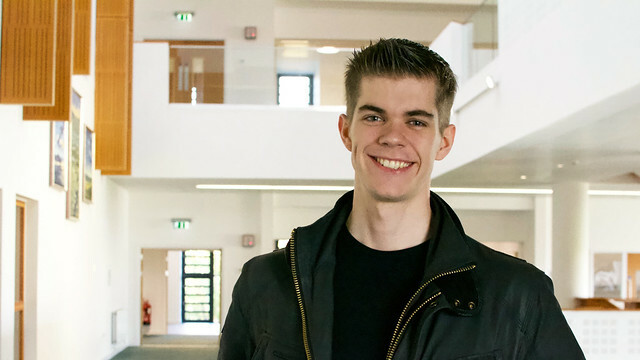 Alex Butterworth, currently in his fourth year studying BSc International Management and Modern Languages (French), has been selected to represent the University of Bath at One Young World in The Netherlands on 17 October. The annual One Young World Summit is attended by valuable young talent from global and national companies, NGOs, universities and other forward-thinking organisations as well as world leaders. Past speakers have included Kofi Annan, Arianna Huffington, Emma Watson, Justin Trudeau, Archbishop Desmond Tutu, Mary Robinson, Sol Campbell and Sir Bob Geldof. Upon winning this year's Faculty of Humanities & Social Sciences competition to attend the summit, Alex commented: "It's a great privilege to have been selected to be a delegate at the One Young World Summit in October. The summit has been long recognised for its internationally leading impact, and I can't wait to get involved in building new relationships, contributing ideas, and hearing from the summit's fantastic speakers." "I'm grateful for the opportunity that being a delegate presents. and I'm hoping to return back to the UK having made the most of the summit and having learnt fresh perspectives surrounding some of the most pressing issues our global community is facing today", he added. For a number of years, the Faculty of Humanities & Social Sciences has been supporting students to attend the prestigious summit designed specifically for young leaders to focus on global issues, which this year includes human rights, plastic pollution, health, equality in education, poverty alleviation and economic development. These issues align closely with the teaching and research which takes place across the Faculty. Over the last two years, previous winners of the competition have gone on to produce their own One Young World Bath events which have included speakers from the international event and the University's academic experts. Follow Alex's experiences on the One Young World blog and on Twitter @OYWBath.